If only pig prices were as hot as the weather we would all be much happier although the SPP only moved marginally this week, dropping by 0.08p to 150.26p. German prices actually moved ahead by two Euro cents to regain what they lost a week earlier with their producer price now standing at €1.41, which is equivalent to 125.5p in our money. Despite this slightly positive sign, UK bacon prices remain under pressure. Most weekly contribution prices are continuing to ease back by between 1-2p and the spot market is not for the fainthearted, with one off loads of spot pigs worth little more than 142p although regular spot suppliers were generally able to agree deals of around 150p mark to match the SPP. In school report terms, cull sow prices “could do better” with export prices at little more than 60p compared to their value of 96p 12 months ago when the Euro was worth exactly the same as it is now, so for producers looking to replace breeding stock it now takes two cull sows to buy one replacement gilt or “BOGOF” in reverse. Weaner margins continue to suffer from the deadly combination of soaring straw and feed ingredient prices and although harvest yields are better than expected in some parts of the country, the whole cereal market remains under a significant amount of pressure. 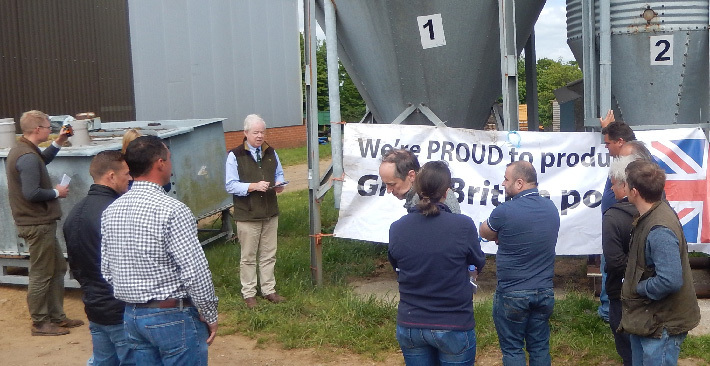 As a result, non-contract weaners have been very hard to place especially those in the Red Tractor category and the latest AHDB 30kg average has slipped by just over £2/head to £53.34, although the 7kg price actually rose by 0.49p to stand at £39.49/head. However, the gap between Red Tractor and Freedom Foods pigs continues to widen reflecting similar trends in finished pig prices. The ongoing scorching weather is continuing to hit weaning weights and fertility levels with some producers reporting a much higher than usual number of sows which have failed to hold in pig which could point to a shortage of pigs emerging later on in the year, but this is of no comfort to producers who need maximum numbers to try and stop too much red ink from appearing on their bank statements. Feed wheat futures prices are continuing to paint a bleak picture for pig producers with London feed wheat quoted at £192.30/t for November and further downward yield revision forecasts across many major wheat producing countries. Concerns also continue over the viability of UK wheat and UK rapeseed prices have also risen significantly reflecting global soya bean price rises. And finally, despite the recent bad news following The Times newspaper article on a Red Tractor pig unit welfare report, good news from the NPA that its widely promoted 2016 Antibiotics Stewardship Programme has made rapid progress in reducing and refining antibiotic use, so a pat on the back to the promotors and participants who have managed to reduce the level of antibiotic usage by over 50% in just 2 years and that Red Tractor standards have been updated to help drive responsible use of antibiotics in pig production in the future.